Even though that may happen and no one knows about it, when does it say about my self-control? What does the action of not being able to control my morning habits say about myself? For those of you that read my blog, you know that my last post was about how the Lord is teaching me about the fruits of the spirit. First up was self-control. For the past twenty or so days, I've been studying the word to see what it says about developing biblical self-control. As there are fruits of the spirit, there are also fruits of self-control. We'd all like to say we are good at each of these things, but are we really? When it boils down to it, self-control is doing what needs to be done when it needs to be done. Like getting out of bed and not pressing the snooze button. In Hebrews 12, the Lord talks about how he disciplines the ones He loves.. Y'all, why do we always think we need to figure out the root and reason why the Lord is disciplining us? What if the reason isn't because we did or are doing something wrong, but simply to mold us and shape us into a stronger leader for Him? As Americans, we tend to take this season of discipline like a time out. And since we live in a self-centered world, we think, 'oh great, time our for ME to think about whats wrong with ME, oh poor pitiful ME.' No! It's about our personalities being molded to be more like him. I tell ya what, I haven't met anyone with as much self-control as Jesus. He resisted all sin. Now that's self-control y'all. If you are in a current season of discipline (like me! ), don't look at this time as painful. REJOICE PEOPLE! Self-control is a necessary to live out all of the other fruits of the spirit. 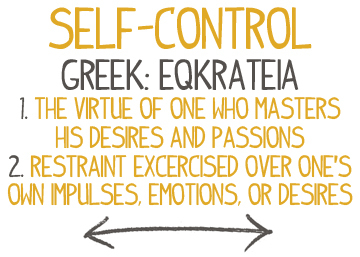 How do we love without self-control? How we do have peace without self-control? How do we have kindness without self-control? Same for each of the other fruits of the spirit. It just ain't possible! Why do we need self-control? The Lord literally calls us to DIE to ourselves for him. I encourage you to ask yourself that question and let the Lord reveal that to you during the rest of this week. Great post. Really love this stuff! 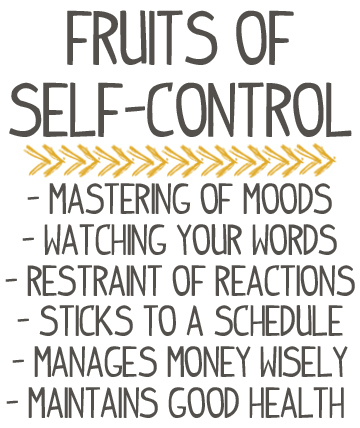 Liked your entry on self control until I read the last one......maintains good health. Please think about the people who have chronic illnesses that have nothing to do with a persons ability to control it. These statements come over as judgmental.